Metrics Explorer lets you build ad-hoc charts for any metric collected by your project. 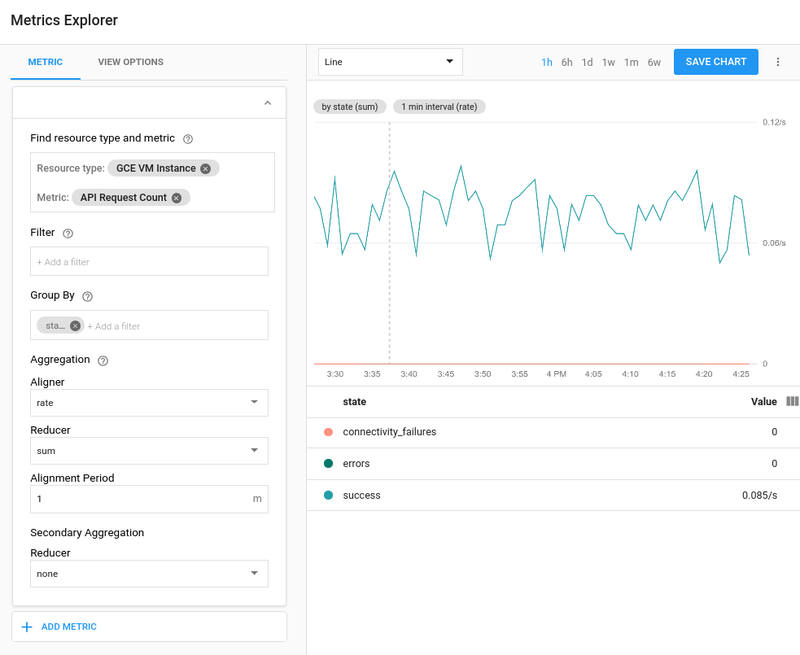 You can use Metrics Explorer to explore data that you may not necessarily need on a dashboard, although charts built with Metrics Explorer can be saved to dashboards. You can also create a URL for the chart so it can be shared. Use the Metric tab to select the metric to explore. This tab brings up the metric-selector UI. Use the View Options tab to change the display characteristics of the chart. This tab brings up the chart-configuration UI. A chart showing the selected metric. To bring up Metrics Explorer, follow Resources > Metrics Explorer on the Stackdriver console. The components of the Metrics Explorer page are used in multiple places. For example, the Add Chart page, used for creating a chart to add to a dashboard, is nearly indistinguishable from Metrics Explorer, offering the same tabs and chart region. The page for creating alerting-policy conditions uses the same metric selector for selecting a target monitored by the alerting policy. For information on the Metric tab, see Selecting Metrics. For information onthe View Options tab, see Setting View Options. For information on using the chart to explorer your data, see Working with Charts.